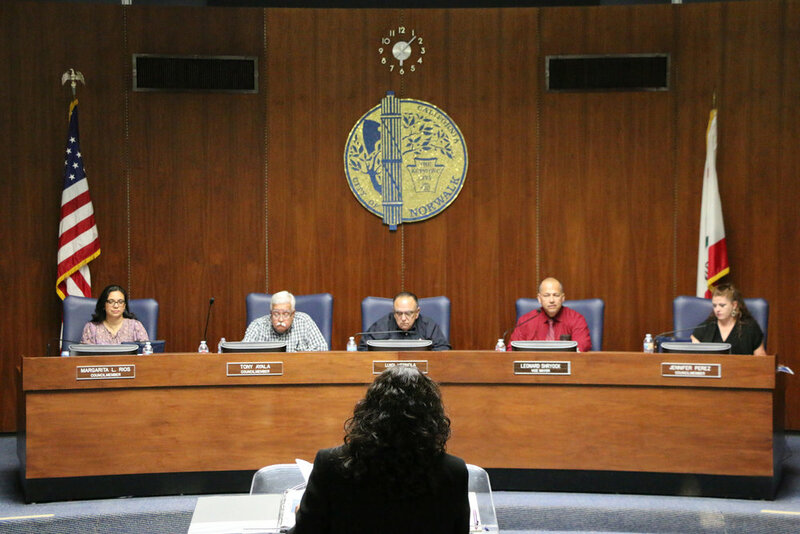 NORWALK – An anonymous video alleging nepotism in city hiring practices and potential employment qualification manipulation is circulating among city staff as well as members of the City Council. The video, which was delivered to a Norwalk Patriot freelance reporter, also claims to show a city employee teaching a small child how to play beer pong, supposedly at a Norwalk park site. Vice Mayor Leonard Shryock, along with council members Jennifer Perez, Tony Ayala and Margarita Rios, confirmed they have viewed the video. Mayor Luigi Vernola canceled a scheduled interview last week, claiming the city attorney recommended he refrain from commenting due to the issue being a personnel matter. “Public Safety Director Carlos Ramos and Human Resources Director Cathy Thompson are heading an investigation into the contents of the video and its accuracy,” Shryock said at last week’s Coffee with a Cop event. Shryock’s concern was the part of the video purportedly showing a young child being instructed in a game of beer pong, where players take turns bouncing ping pong balls into cups of beer. Shryock went on to say that it was former city manager Mike Egan who made him aware of the video on Sept 6. Two days earlier, the council in a closed-door meeting voted 3-2 to sever its relationship with Egan. On Sept. 12, council members officially voted 4-0 to fire Egan as city manager. Asked for an interview Sept. 18 on the steps of City Hall, human resources director Cathy Thompson stated, “I don’t want to talk to the press right now.” No further comment was given. The letter refers to Rosie Lozoya, who was hired as a Recreation Supervisor despite lacking a bachelor’s degree, a requirement for the job, according to the city’s official job posting.